Two female suicide bombers killed 45 people and wounded 33 others when they detonated explosives in a crowded market in Nigeria's restive northeast, the emergency service said on 10 December. The army on Friday put the death toll at 30. "From our updated records we have 45 dead and 33 injured in the twin suicide bomb explosions in Madagali," said Sa'ad Bello of the National Emergency Management Agency (NEMA) in Adamawa state. While there was no immediate claim of responsibility, the blasts bore all the hallmarks of Boko Haram, which regularly uses women and young girls to carry out suicide attacks in its seven-year insurgent campaign in the troubled region. Military spokesman Badare Akintoye had earlier said, "At least 30 people have been killed in the suicide blasts carried out by two female suicide bombers in the market." A local government official and the National Emergency Management Agency (NEMA) confirmed the attack. 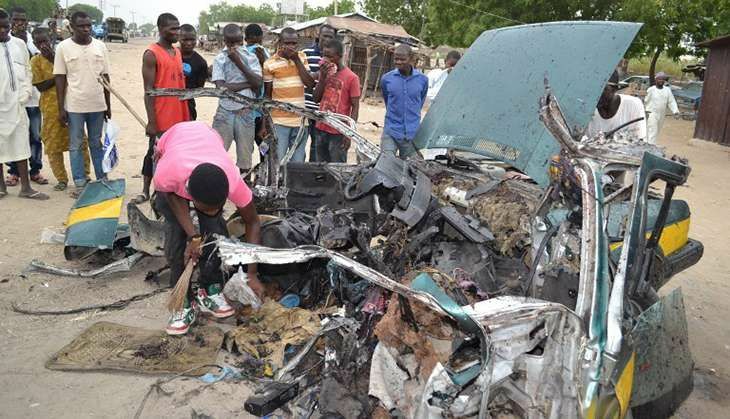 "The two bombers who (were) disguised as customers, detonated their suicide belts at the section of the market selling grains and second-hand clothing," said Yusuf Muhammad, the chairman of Madagali local government. The attack on Madagali, which was recaptured by Nigerian forces from Boko Haram jihadists in 2015, was the third time the town has been targeted since December last year when two female suicide bombers killed scores. Market trader Habu Ahmad said yesterday's blasts happened around 9:30 am (0830 GMT). "It was dead bodies and wounded people in the midst of blood, spilt grain and abandoned personal effects," he said. Ibrahim Abdulkadir, NEMA spokesman for the northeast, said rescue teams had been deployed to the scene. He said security agents had cordoned off the scene of the explosions. Nigerian President Muhammadu Buhari condemned the attack in a statement yesterday, vowing to put "an end to this senseless loss of innocent lives". "This latest attack is obviously an act of desperation, but the Nigerian military will neither be distracted nor relent," he said. He urged Nigerians to be more vigilant and immediately report any suspicious activity to the nearest security agents. "The battle against terrorism is a joint effort involving all citizens, both government and governed. Together, Nigerians can and will defeat the evil that is Boko Haram," he added. Buhari had told a security conference in Senegal on Wednesday that the situation in the region was "under control".